Loose wheels on my bags, broken handles, and random pieces of airplane poking me in tender places; these are just a few of the problems I’ve had while traveling that required some sort of tool to repair. Because of these experiences, I prefer to have at least a simple set of tools with me wherever I am, as much as I can. That includes being ready to take care of the little things when I travel. For that, I need a TSA approved multi-tool. The TSA website clearly lists the items that are prohibited, either on-board an aircraft or in your checked luggage. A review of this list reveals that, for the purposes of this article, the real issue is blades and cutting tools. So, our tool choices must not have knife or razor blades. Luckily, the list of choices without blades continues to grow. These tools are, in my opinion, the best TSA approved multi-tools available for air travel today. 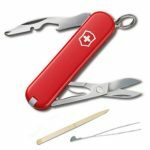 The classic Swiss Army knife, built by Victorinox and/or Wenger, has always been a go-to choice for good quality, compact tool sets. As much as I love these multi-tools, the choices are limited when it comes to bladeless tools. The scissors is adequate for small tasks like cutting paper, but that’s about all. The Phillips screwdriver is too small for most screws and the wire stripper is difficult to use. Basically, you have a scissors and a bottle opener with a tweezers and toothpick. This is great if that’s all you need, but for $20, I think there are better options. For a little less than the Jetsetter, I recommend the Air Traveler, while they are still available, if this is the kind of tool you need. 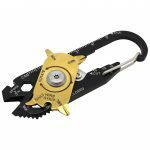 The recent popularity of keychain tools in the preparedness community has spawned a couple of interesting tool options for air travelers. Two that I find quite useful are the CRKT Get-A-Way driver and the True Utility FIXR. 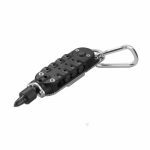 The CRKT Get-A-Way driver is a small, compact bit driver that comes with two flat and two Phillips bits and includes a small flashlight and a bottle opener. The tool can be used as both a standard bit driver or an angle (T-handle) driver. It will also accept most 1/4 inch bits, like those found in most bit kits, so its capability is quite expandable. Watch this short video from the manufacturer about the tool for a better look. Additionally, you can use the 1/4 inch nut driver to hold almost any 1/4 inch bit which, again, increases the functionality of the tool. For more, watch this cute video about the tool. Both of these tools surprised me. I loved the sturdiness and functionality of the Get-A-Way driver and was surprised at the number of use-able tools included in such a small device as the FIXR. Either of these could be a good option, especially when traveling, to provide a small, useful set of tools. 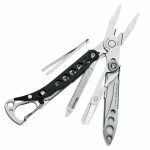 The world of multi-tools is massive, but there are currently only two good options for air travelers, in my opinion; the Leatherman Style PS and the Gerber MP600 Bladeless. 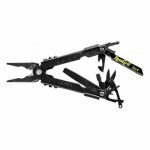 With a price tag around $30, this tool is a great option for those who want to have a good set of small pliers handy when they travel. Combined with the Get-A-Way driver, the Style PS make a great little tool kit for air travel. If a full-sized multi-tool is what you need, the best (and only) bladeless option is currently the Gerber MP600 Bladeless. The name is actually a bit of a misnomer because there is a blade included, just not the kind we’re used to seeing. The MP600 comes with a “grit saw” which is, essentially, a jigsaw blade with a sandpaper-like material where the saw teeth would ordinarily be. I know some who keep this “blade” in the tool without issues at TSA checkpoints, but I’ve chosen to simply remove it to be sure there are no questions. All of the basic tools I may need while traveling in one compact package. One of my favorite YouTube channels did a good video on the MP600 during a trip to Alaska. 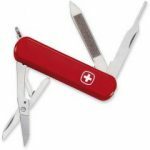 Each of these tools has its place and, depending on your needs, can be a great addition to your carry-on bag. If you’ve been looking for some good tool options to carry with you, these tools offer great value. If this isn’t something you’ve considered before, give one of these a try. You’ll be surprised how often you’ll use these tools, when you have them with you. Take any tool you are carrying out of your bag and put it in a separate bin (opened if necessary) for inspection, before going through the metal detector/x-ray station. Alert the scanner attendant that the tool is yours and that it is bladeless. I tend to just repeat, “That tool is mine and it is bladeless.” In the case of the MP600, I’ve also learned to open the pliers end so that they can inspect it. You would be amazed how many of these front-line TSA officers can’t open a multi-tool and, even worse, how many think all tools are prohibited. Stay calm, remember the phrase, “It’s bladeless” and ask for a supervisor if necessary. Taking the tool out of the bag allows them to focus on the tool rather than destroying your carefully packed bag to find a “suspicious” item. Once they return your property to you, grab a cup of coffee, a bottle of water and settle down to enjoy the rest of your trip.